Songs about the Korean War are fairly rare, at least when compared to other American Wars, and were dominated by four main themes: patriotism, the soldier in battle, faith, and emotional pain. 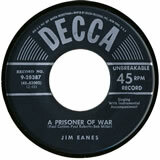 A few songs expressed discontent about the war, but none of them opposed it outright . 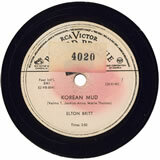 In this context, Korean War songs represent a transitional phase between the patriotic and sometimes naive songs of World War II, and the anti-War songs of the Vietnam era. 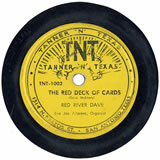 Most Korean War songs came from the country music genre, just a few years before the advent of rock 'n' roll. 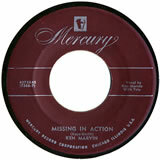 The song first appeared on the Billboard charts on October 7, just as the escalation phase of the war was nearing its conclusion, and peaked at number 9. 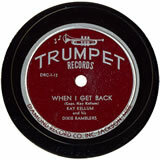 Wilif Carter recorded a tune in the vein of the patriotic "saying goodbye" song that was so popular during both of the World Wars. In "Good-bye Maria, I'm Off to Korea," the narrator is a corn farmer from Iowa who had married an Italian girl during his first tour overseas, presumably during WWII. Now it's the "same old story" and he is back in the service to "win another fight for liberty. Jimmy Dale also recorded a version in 1953. 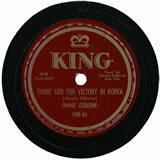 Jimmie Osborne followed up the success of "God Please Protect America" with "Thank God For Victory in Korea." Recorded on October 2, 1950, Osborne seems to have reacted to the successful Inchon landings in September, and the subsequent successful push-back of North Korean troops. This musical declaration of victory would prove to be premature, however, as Chinese forces entered the fray only three weeks later, fundamentally changing the character of the war. Another patriotic song addressing the Korean War was "Korea, Here We Come" by Harry Choates, a Cajun fiddler whose career was tragically cut short in 1951. Choates recognizes the sadness once again felt by American mothers as their sons go off to yet another war, but then follows up with, "They've done made us mad. Korea, Korea, Korea, here we come!" General MacArthur is supposed to have wanted to use 50 atomic bombs and lay down a permanent radioactive belt along the Yalu River. President Truman, however, decided not to use the atom bomb again. MacArthur made a series of statements, in defiance of Truman's stated war policy, in which he threatened to escalate hostilities with China. Truman fired him for insubordination, a decision later supported by the Senate Foreign Relations Committee. 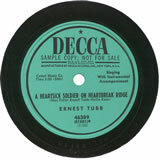 Several patriotic songs were written specifically about President Truman's dismissal of General Douglas MacArthur in 1951. Republicans in Congress made a hero out of MacArthur and invited him to address a Joint Session of Congress. 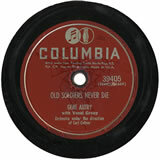 Not surprisingly, country music artists sided with the Republicans and canonized the general in song, including "Old Soldiers Never Die" (based on MacArthur's famous line from the speech that "Old soldiers never die, they just fade away"). 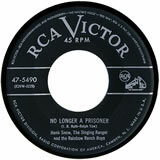 The song recounts the general's World War II career, especially emphasizing how he promised to return to the Philippines and then did, bringing peace to the Pacific region. The song does not mention anything about his performance in Korea. 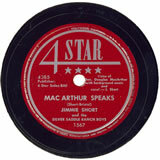 Gene Autry recorded the first version the day after MacArthur's speech, and it appeared on the country charts on June 9, 1951. 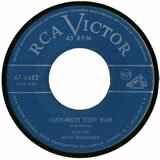 Other artists who covered it included Vaughn Monroe and Jimmy Wakely. Osborne openly fears atomic annhiliation of the human race, but is confident such a fate can be avoided through prayer. 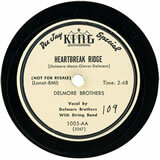 Recording new versions of old war classics is a time-honored tradition in American music. For the Korean War, these are extremely rare. Jack Boles recorded a new version of the WWII hit "There's a Star Spangled Banner Waving Somewhere." This classic is about a crippled boy who still wants to do his part to defeat the enemy. The original version include the lines, "Let me show my Uncle Sam what I can do, sir! Let me help to bring the axis down a peg." For the update, Boles simply changed the word "axis" to "enemy". The rest remained the same. 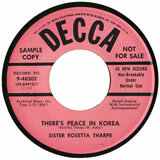 Finally, Sister Rosetta Tharpe's upbeat song, "There's Peace in Korea," celebrates the end of the war while giving credit to President Eisenhower for fulfilling his campaign promise to end the war. good to me." 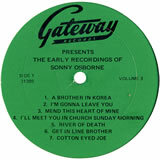 Sonny Osborne's "A Brother In Korea" laments that American soldiers are off to fight another war. He seems to suggest that, sadly, people just aren't happy without a war. 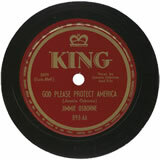 Some battle-related songs, however, remained at least moderately patriotic. 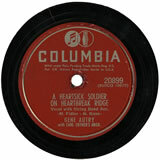 One of the more popular songs of the war was "Heartbreak Ridge," a song that takes place in the aftermath of the long and bloody fight that ended in a costly UN victory in mid-October 1951. Casualty figures in that battle were estimated at over 3,700 American and French and an estimated 25,000 North Korean and Chinese. The song's narrator views the conflict as a struggle between good and evil: "We fight the Reds trying to win, to rid this world of hatred and sin." He reflects on the heroic sacrifice of a buddy from down the street in his hometown. Yet, standing atop the ridge, he takes in the enormous destruction: "On Heartbreak Ridge I stand tonight, with nothing but wounded and dying in sight." 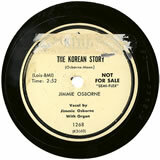 In "The Korean Story," Jimmie Osborne took the opportunity to correct his earlier assumption that, following the initial UN successes, the war was over: "China entered in, MacArthur was dismissed, there was no chance to win." Finally, the narrator in the song thanks God again that the war has finally ended, and humbly prays for everlasting peace. The Heart stood for Christ's blood, all shed in vain. The Diamond signified the real precious jewel, the communist party. The POWs kept faith, however, and were immune to the Red propaganda. After the soldier tells his story, he rips up a deck of playing cards and heads off toward a Korean chapel. Many of the remaining songs about the Korean War are about some form of emotional pain. In these songs, soldiers fear that their loved ones will not remain faithful (Arkie Shibley's "Uncle Sam Has Called My Number", and Kay Kellum's "When I Get Back"), despite assurances from their women that they would be (Joni James' "I'll Be Waiting For You"), and they mourn the loss of relationships that were beyond their control to save. Will my prayers be answered on Heartbreak Ridge? Will the one that I love still be true? Does she count the hours until I return? 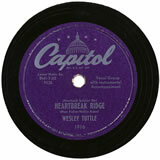 "A Heartsick Soldier on Heartbreak Ridge" was recorded by Ernest Tubb, Gene Autry, Wesley Tuttle, and Ken Marvin. And love-sick songs weren't confined to just Country Music. Blues artist L.B. 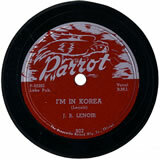 Lenoir recorded similar sentiments in his song, "I'm in Korea." Here the narrator wonders, while sitting atop one of the nameless, numbered hills in Korea, whether his girl remembers his admonition to "don't let nobody lay their head down in my bed." The most popular song to come out of the Korean War was an emotional pain song by Jean Shepard and Ferlin Husky called "A Dear John Letter," recorded on May 3, 1953. "Dear John" appeared on the Billboard country charts the week of July 25, just a two days before the truce at Panmunjom was signed. This coincidence may have helped prompt sales, given that one of the lines in the song reads, "For the fighting was all over and the battle had been won." 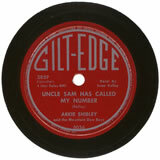 The song is about a soldier who has received a letter from his sweetheart, notifying him that he has been jilted by his lover, who has wed not just another man, but his brother Don. 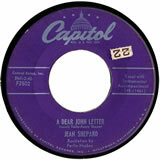 The term "Dear John Letter" had been used since WWII as a term to describe such breakup letters. 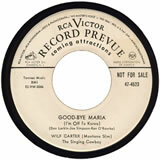 "A Dear John Letter held the number 1 spot on the country charts for six weeks, and remained on the charts for twenty-three weeks. 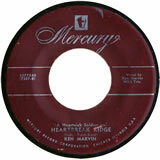 It had a big impact on the music careers of both Shepard and Husky. "A Dear John Letter" inspired two sequels, each written independently and after the truce had been signed. 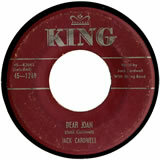 The first was "Dear Joan" by Jack Cardwell. This might be considered a kind of saving face song. In "Dear Joan," the narrator is actually happy to have received the "Dear John" letter from the previously unnamed Joan, for he actually still pines for Joan's sister Sue. Now he's free to pursue that other relationship. 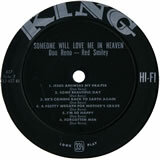 The second sequel, called "Forgive Me John," was written by Shepard and Billy Barton, and Shepard and Husky reprised their roles as vocalists. In this rendition, the author of the original letter sends a follow up in which she explains that she still loves him. She asks for his forgiveness, but John rejects any notion of reconciliation and instead expects to lead the soldier's life of solitary loneliness. 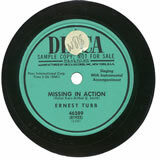 Jim Eanes first recorded "Missing In Action" in early 1951. 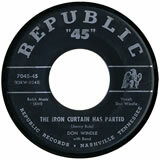 It was then covered by Ernest Tubb, Ken Marvin, Jimmie Osborne, and Jimmy Wakely. 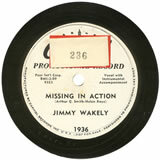 "Missing In Action" inspired an answer song, recorded only by Jim Eanes, for those listeners who couldn't live without a happy ending. In "Returned from Missing In Action," the wife sees her former husband walking away. She realizes what has happened and she runs outside to catch him and explain that she still wants to be with him. The new husband dutifully bows out so that the original lovers may rightfully be together. The emotional pain of loss was another theme explored in several Korean War songs, especially during the latter months and in the immediate aftermath of the conflict. 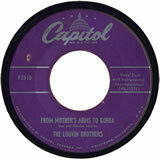 In 1953 the Louvin Brothers recorded "From Mother's Arms to Korea," about a mother who receives her son's unfinished diary in the mail, "an unfinished diary that she once gave her darling son." The diary ends abruptly at the front lines, and the final entry is filled in by "his buddy, from a foxhole to a mansion on high." buddy. Later in the war, that friend was listed as missing in action. It's a few years later and, though the narrator is home and has started a family (naming his son after his buddy), in his dreams, the narrator still searches for his best friend. Lone Pine's "Fuzzy-Wuzzy Teddy Bear" does a fine job of depicting the sorrow of a grieving father, prompted by the discovery if his son's favorite childhood toy. The father is "proud he died a hero, but no joy prevails tonight." 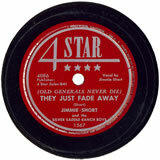 The song concludes with the image of the teddy bear sitting all alone and sharing "the bitter truth so brave." 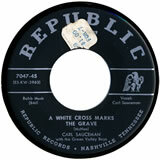 A rare recording produced by Canyon records some time around the end of the war reminds us that America's wars are fought by a diverse people, each with their unique cultural traditions of memorializing an event. In this recording, the Oglala Sioux Singers give us the "Sioux Korea Memorial Song." Although the lyrics are in Lakota, it's not difficult for non-Natives to feel the emotion being conveyed.